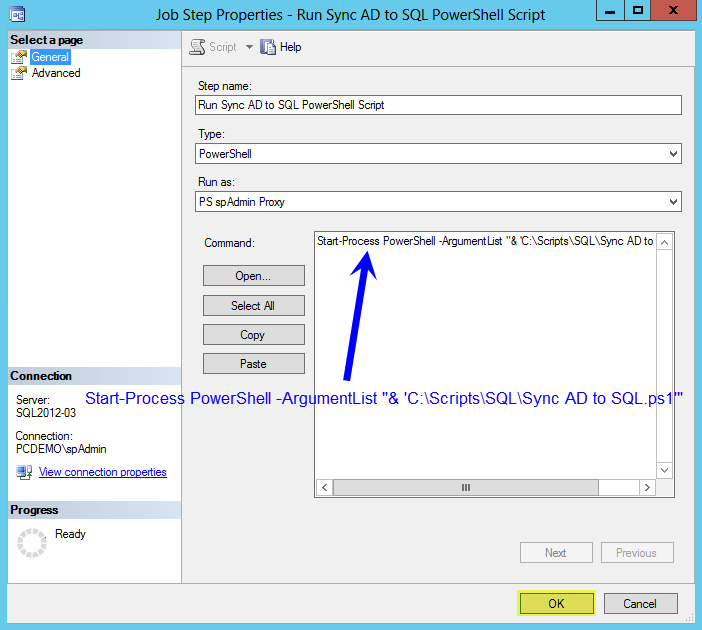 In a previous blog post, Synchronize Active Directory With SQL pt II, I mention creating a Scheduled Task to run the PowerShell script to keep AD synchronized to SQL. 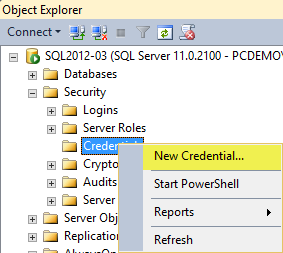 Then a colleague of mine, Don Kirkham (@DonKirkham) asked if it was possible to run a PowerShell script from within SQL. Well Don, the answer is "Yes", but there is a caveat... While SQL Server 2012 is running on Windows Server 2012, PowerShell for SQL is at version 2 and Windows Server 2012 is running PowerShell v3. We will address this issue later in the blog. The other issue to be aware of is the warning from Microsoft, which says, "Each SQL Server Agent job step that runs PowerShell with the sqlps module launches a process which consumes approximately 20 MB of memory. 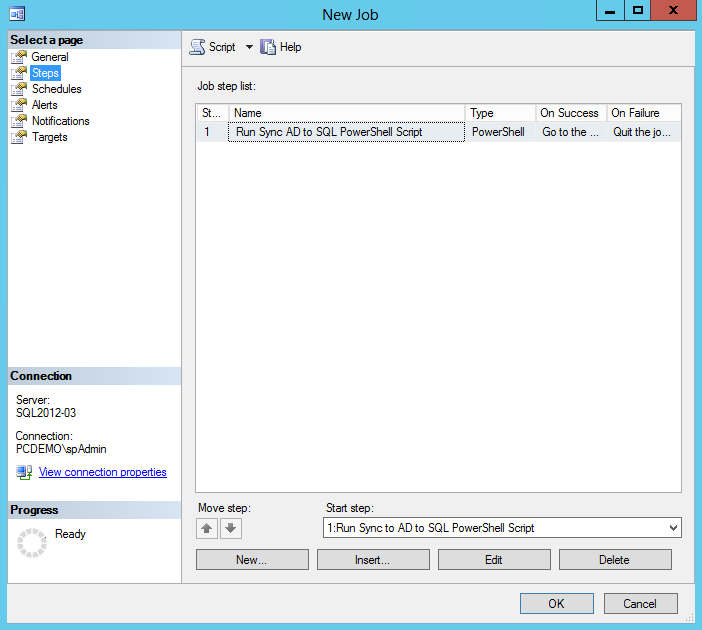 Running large numbers of concurrent Windows PowerShell job steps can adversely impact performance." So be careful not to choke your server. Create a SQL Server Agent Job that runs a PowerShell script at a specific time and interval. In other words, a SQL job that mirrors the Scheduled Task created in my other blog post on how to Create a Scheduled Task With PowerShell. 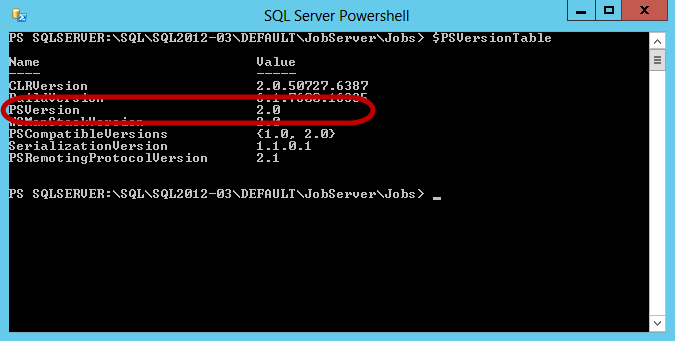 As was just mentioned, PowerShell within SQL runs Version 2. 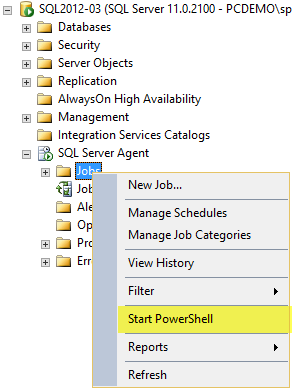 If you were unaware that you could run PowerShell from within SQL Server Management Studio (SSMS), right-click on a folder, and select "Start PowerShell". Microsoft was nice enough to not make the option available for every folder, so for this blog, we are going to use the Jobs folder. 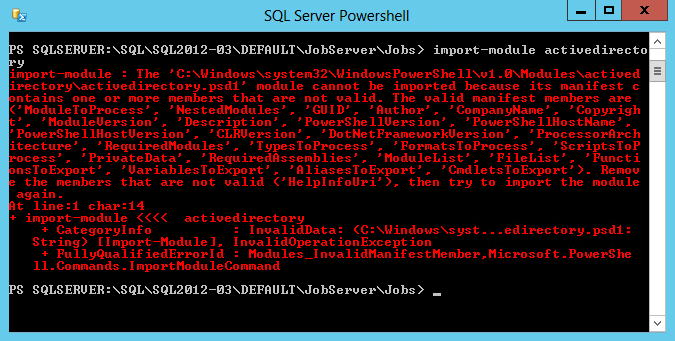 you will see that SQL 2012 PowerShell is running V2. Here is where the problem begins. When you try to run the Sync AD to SQL script, it will error out, because the ActiveDirectory module is for PowerShell version 3, and when you try to import the module into version 2, your window will fill with RED. 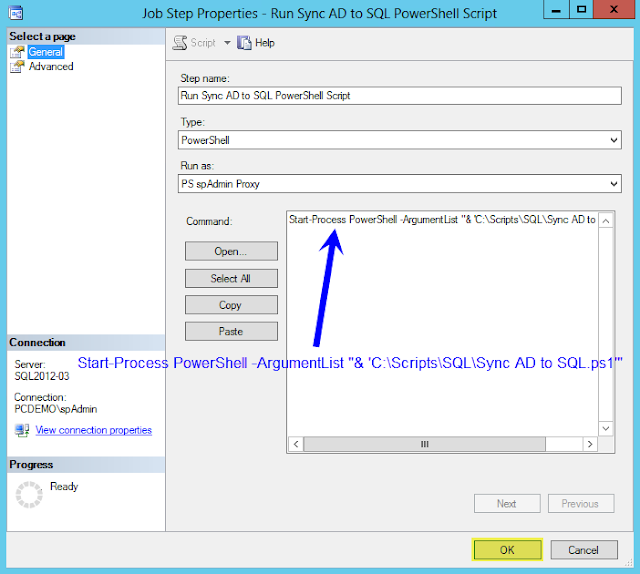 Start-Process PowerShell -ArgumentList "& 'C:\Scripts\SQL\Sync AD to SQL.ps1'"
Notice the single quotes around the location of the file that we are going to run. 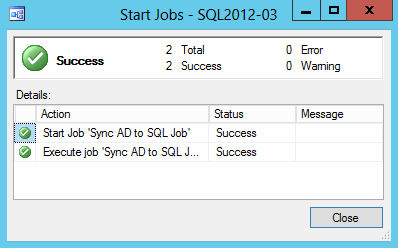 Now that we have the proper syntax to get our v3 script run from within SQL, it is time to create the Job. The nice thing about using PowerShell to create a Scheduled Task is the ease to create the RunAs account for the Scheduled Task. 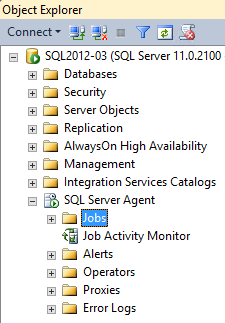 Within SQL, there are a couple of hoops that you will need to jump through to create the RunAs account for the Job. 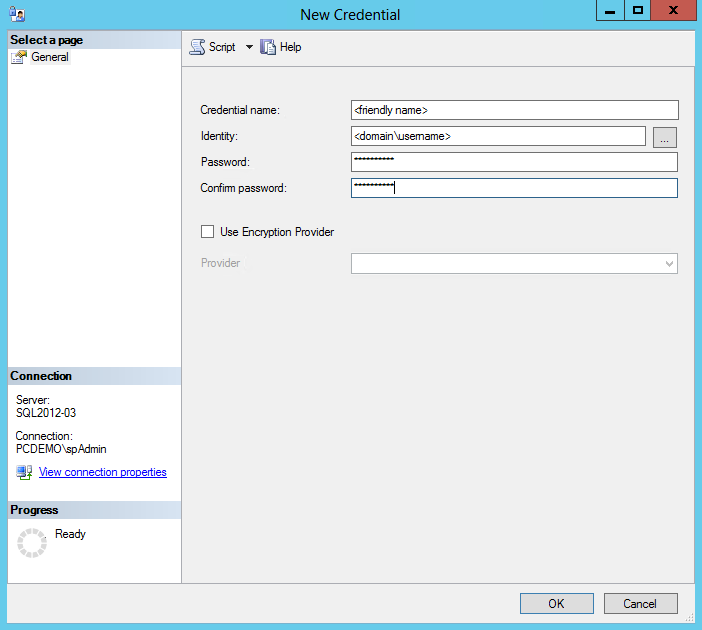 Now that we have the Credential and the Proxy accounts created, the Job can be created. 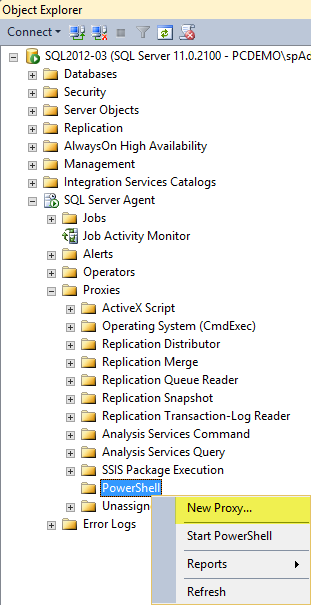 From within SSMS connect to the SQL Server that is going to be running the Agent Job, and expand the object explorer to show the Jobs folder. This will open up the New Job window. 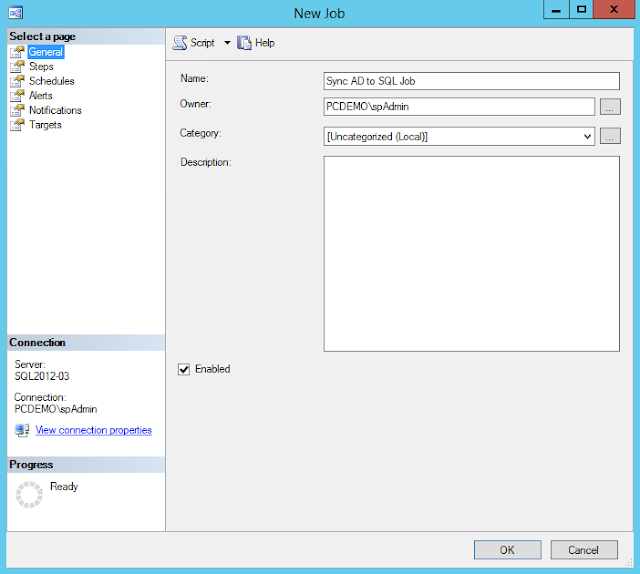 Under the General page, you will want to give the Job a friendly name, and make sure that your Job is Enabled. 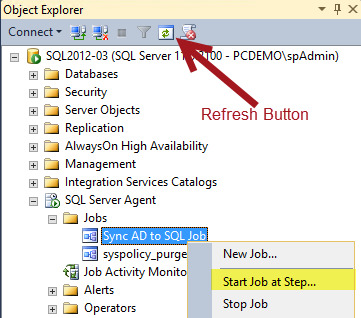 From within the Steps page, we will create our one and only step for this post, which will be to execute the Sync AD to SQL.ps1 files in a new PowerShell v3 window using the spAdmin Account. At the bottom of the window click the New... button, which will open up yet another window, the New Job Window. 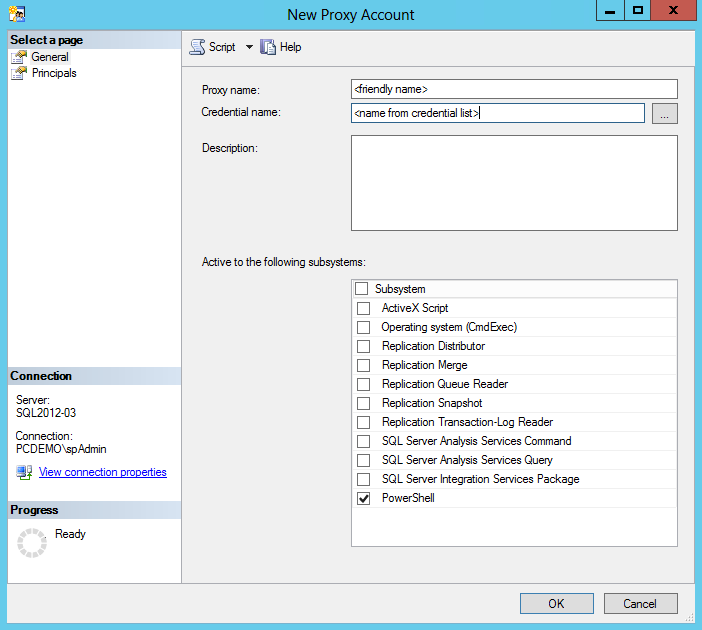 Run as: Select the proxy account you created earlier. Next, click on the Schedules page, and click the New... button at the bottom of the Schedule List. This will open up a New Job Schedule window. 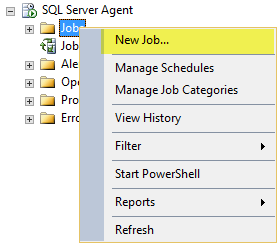 You should now be able to create a SQL Server Agent Job instead of a Scheduled Task to run a PowerShell script. Thank you again Don for the blog idea.